At Essential IFA we understand that all of our clients’ needs are different and there is not a ‘one size fits all’ solution to managing your finances. We analyse your entire financial situation at the outset. 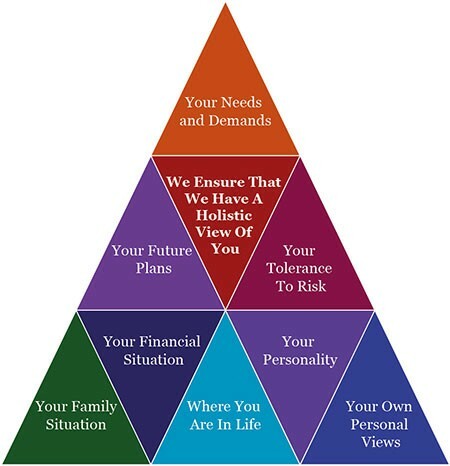 We consider your needs and goals as well as factors such as your tolerance of risk in order to gain an accurate picture of you. We make our recommendations only when we have reached this stage. We will never make any assumptions and we will take as much time as needed to make the right choices. We work hard to ensure that we always offer the most appropriate solution for you. We will explain in jargon free language how a scheme may work and what the implications may be for you and your family, and what actions you may need to take. We will always analyse the market, and review our advice to you on a regular basis, to ensure your money is constantly working hard for you. Our goals are always to demonstrate professionalism, integrity and fairness. We guarantee that our service to you will be thorough and in a language you understand. We will be transparent and always available to answer any questions or queries you may have.